What makes the Voyager so popular amongst hi-fi headphone amplifiers is its wonderful big headphone-amp sound, and that it can take the knocks! Unlike those 'blingy looking scratch-magnet' headphone amps, the Voyager's rugged contruction helps it keep its appearance much longer. Another simple but great benefit is the ease of battery replacement - its E-cell power source is available in lots of shops. Not that you'll be replacing it all that often, as it lasts for up to 50 hours continuous playing time! The Voyager is supplied with battery fitted (as required by the "Battery Directive"), and is also supplied with a mains power supply for non-mobile use. Plus, it can pick up its power from a 5V USB source! When customers asked us to make a battery-portable headphone amplifier we asked them what they wanted from it. The number one must-have was a proper high quality rotary volume control with a proper control knob, and not an awkward to use side-wheel or those awkward up and down buttons which are either dead-slow or always over-shoot. We obliged, and every Voyager is fitted with an Alps quality "mini-velvet" volume control. It's hard-wearing and in a period of 8 years since its 2007 launch no one has had a scratchy volume control! The next on the agenda was its power: "give us an easily replaceable battery". They didn't want rechargeables, built-in or replaceable. They simply wanted a disposable battery they could dump and replace on the go – never forgoing their music. We made it easy by designing it for a 9 volt E-cell, which you can pick up virtually anywhere. We went a step further and made the battery last a long-long time. It's made a lot of people very happy - some of them reporting battery life of up to 50 hours continuous playing time (as we'd tested). The battery lasts some people so long they forget it's got one, and we have to remind them to replace it when they complain it's stopped working! They also wanted as many alternative power options as we could squeeze in, so the Voyager has a DC socket for use with the supplied outboard "plug-top" power supply, enabling you to listen at home whilst saving on the battery. Plus, we put in a voltage converter and gave it a mini-B USB socket so users can 'borrow' power from any 5V USB source - computer, charger, in-seat power etc (lead not included). And for dual use as a home amp as well as on the move, we gave it two 'sound qualities': Straight - for the best sound from quality headphones and IEMs; and Contour - for street-wear headphones that need a little more tonal boost. But most of all, our customers wanted something that kept its looks, because so many portable headphone amplifiers lose their attractive finishes in no time at all. The Voyager's textured ABS case goes a long way in disguising wear and tear. Because the Voyager's line-input is such a light load, your device's headphone output will perform better and be more like a line output, and with the music coming from the Voyager instead, you will notice a valuable improvement. Not only that, it removes the battery drain of headphones from your device letting it go further between charges - and because the Voyager takes an easily obtainable E-cell there's less chance of you being without your sounds. And at the risk of sounding like we're repeating ourselves, the Voyager's E-cell lasts longer than you'd think. And its sound? Like we began, it's made to sound just like our desktop headphone amps - the only difference being it doesn't go quite as loud... because it's a battery-portable! With so many applications, the Voyager is a viable option for those seeking to upgrade their sound. To test out the theory that the Voyager can bring to life even the most generic of headphones we used it in conjunction with a variety of standard headphones, namely: the generic Samsung headphones supplied with the Galaxy Note 2 and a set of official idevice headphones. Audio quality through both sets of headphones normally was average, however once connected to the Voyager the transformation was instant. Audio clarity and depth was enhanced dramatically, hard to believe we were actually still listening to the same audio through the same set of headphones. 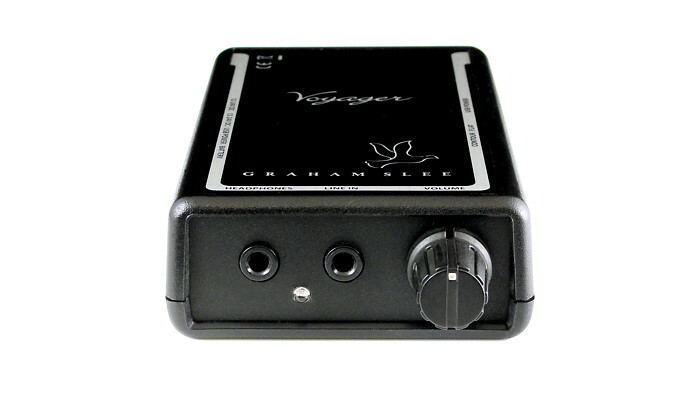 Graham Slee have all the ingredients of a truly superb piece of audio equipment – if they were baking pies they’d be the best in the business. As it happens, they are not pie makers and the Voyager is a real best in the business audio contender. Sittin here in the sun listening to the Voyager and now I know what the fuss is all about. Astounding quality. The most analogue headamp I've ever met. Kills my old Fostex hp p1 and the mooted Centrance Hifi M8 to kingdom come. My old Fiio E11 is in the recycle bin too. No hint of digital hash..wow. massive sound stage. Clarity is sublime. Where's the distortion gone? Black background and no noise i can hear. Senn Momentum sounds beautiful now. Senn HD 650 and Audeze stupefyingly sound great too from such a small box. All in all a mini Novo!!!! Bravo Graham and his gang...once again. I didn't know what to expect but I have been amazed at the extra warmth & depth that I now have together with the increased separation & clarity that the Voyager brings. Logically, you know all of that but it has surprised me at just what a difference it has made. It really is incredible. I tend to use it without the Contour switch-on. So thank you. It really is a great product. My Shure IEMs are in my ears, connected to my Voyager, connected to my iPod. Handel's Messiah. Pure Joy. Nuf said.